Although previously referenced Statistics Viewer feature is a convenient instrument to explore and analyze the monitoring results, sometimes it might be not enough. While it's perfect feature for the system administrators, other staff may need to see statistics as well, and this is not a good idea to give everybody full access to ProtoMon. Also, the superiors do not like to grapple with software at all. They prefer the monthly reports which come to their mailboxes. 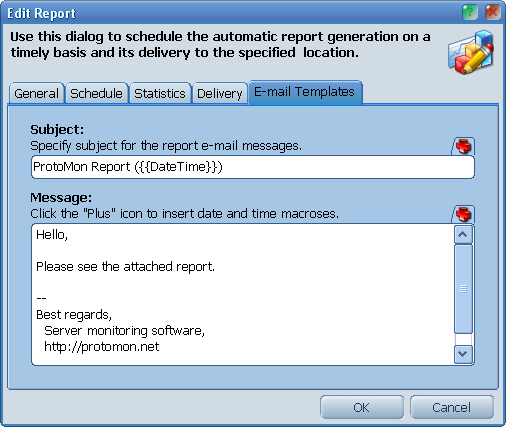 With the Reports Scheduler feature you can rest assured that ProtoMon will automatically generate necessary reports at planned time and deliver them to the specified recipients. Switch to the Reports tab to start managing your reports. 1. The General tab. Here you can specify the report name that will be displayed in the report list and also in the report's title. The second parameter is Archive Filename. The report consists of several files (html, css and images) which will be zipped to a single archive. You will need to specify the name for this archive. The ".zip" extension will be added automatically by ProtoMon. 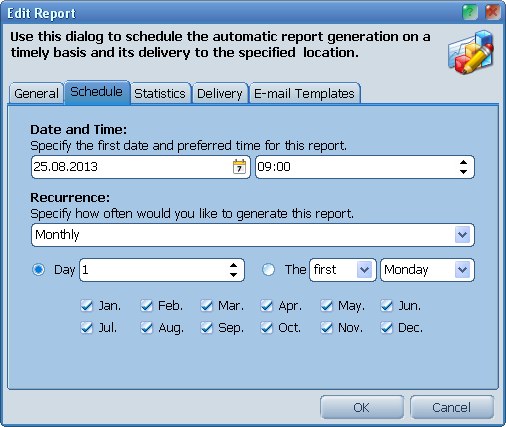 The name can include the date/time macroses that will be substituted by actual values when generating the report. Click the red "Plus" icon to see the list or available macroses and to insert them. 2. The Schedule tab. Use this tab to point how often ProtoMon should generate this report. 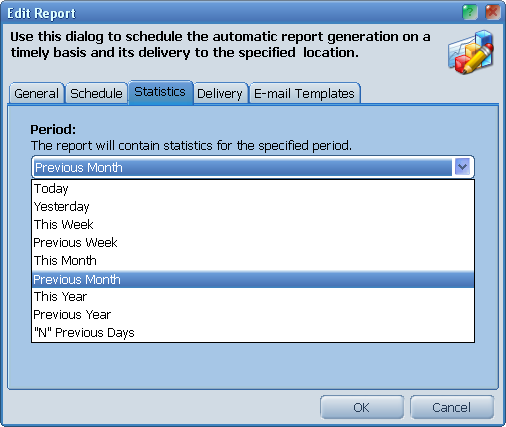 The daily, weekly and monthly recurrency options are supported as well as the one time reports. The Date field specifies the first date. No report will be generated until this date, even if some recurrency option is selected. The Time is a preferred time. Which means ProtoMon will try to generate report exactly at this time, but if the program was not running and was launched later, the report will be generated later this day. 3. The Statistics tab. The report will contain the statistics for a period specified on this tab. The today, yesterday, this week, previous week, this month, previous month, this year, previous year and "N" previous days options are supported. 4. The Delivery tab. 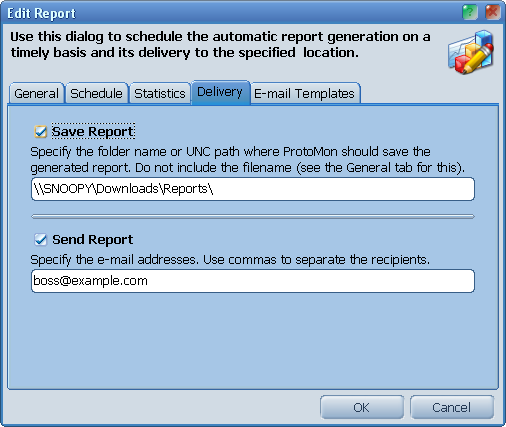 ProtoMon can save generated report to some local folder or UNC path, or send it to the required e-mail addresses. You can specify several recipients dividing addresses with commas. E-mail addresses shouldn't include any full names or organization names, just an e-mail in the "login at domain dot com" form. I.e. John Doe <john.doe@example.com> is not accepted, john.doe@example.com is accepted. 5. The E-mail Templates tab. Here you can enter the custom subject and message text for e-mails with attached reports. Both subject and message text support date/time macroses. The Last Run column in the report list shows then the report was generated the last time. Move the mouse pointer over this column to see the hint with full report generation, saving and sending log. To re-send the report, click the right mouse button on it and choose the Clear Recent Result pop-up menu option. 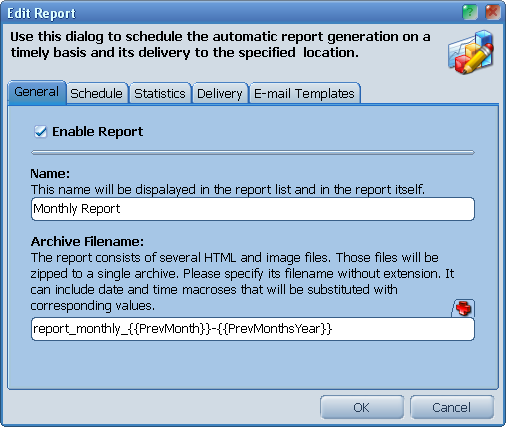 This will clear the last report generation date and log, and the report will be executed again.